Celebrate with us at a very special Valentine Cocktail Party dedicated to our love for Italy. 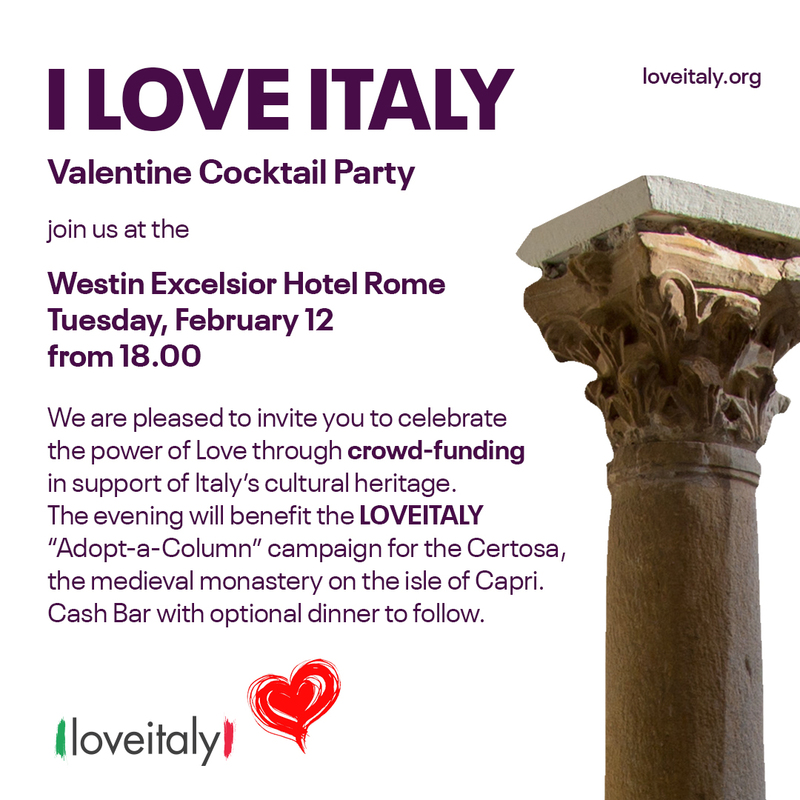 The evening will spotlight the trendsetting efforts of LoveItaly, a visionary nonprofit crowdfunding platform that helps lovers of Italy from around the globe contribute to the restoration of Italian cultural heritage projects. Take this opportunity to get involved and be a part our collective international community by participating in the “Adopt a Column” campaign for the medieval monastery on the island of Capri. Known to locals as “La Certosa,” the site survived seven centuries of pirates, wars, plagues and monastic suppression before embracing its new role today as the cultural heart of this world famous haven. But now the future of this 14th century monument is threatened and a restoration intervention on its columns is urgently needed. Throughout the evening a large screen will follow the crowdfunding movement in real time, showing your impact advancing the needle toward the project goal that has a target deadline of March 2019. There is no cost to attend the "I LOVE ITALY" Valentine Cocktail Party featuring live music, appetizers and a cash bar. To participate, guests are requested to make a minimum €10 contribution directly to the Certosa “Adopt a Column” project at this link. Invite your family, colleagues, friends, and neighbors to be a part of history. Come out and celebrate with us starting at 6 p.m. on February 12th! Become Part of Ancient History & Enlighten Future Generations - Please RSVP for the cocktail party at this link . For those who would like to continue the evening, Westin Excelsior Executive Chef, James Foglieni, proposes an optional dinner menu created exclusively for our guests (€60 per person) wishing to experience the fine dining of the famed Doney Restaurant. Please reserve dinner directly through Lori Hickey at: lorih@hotmail.it).